Why join the only service in the bowling industry that provides bowling center and bowling league information such as standings, team rosters, recap sheets and game-by-game bowling data? 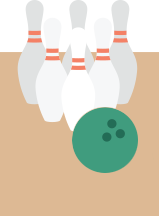 Utilizing CDE Software's Bowling League Secretary (BLS) Program (purchase required), bowling league secretaries or bowling center management have the ability to upload all of their bowling league data absolutely free! Many bowling leagues on our site have data dating back to 2001 when our website was first launched. With this data, the bowlers can view their progression, not just week after week, but also season after season. Tired of not receiving anything for your accomplishments? We now offer Virtual Awards! See our Awards page for more information. Find Leagues, Centers, Teams And More! Find and view leagues and bowling centers around the world. All a part of your free membership! Uploading your data to LeagueSecretary.com is a FREE service. However, a licensed copy of CDE Software's BLS program is required.